Old Town Parker, the "heart of the town of Parker" is THE place to hold events and community activities. With its location and vast parking availability, Parker Station Professional Office Building enjoys a favored location for participating in the many events held in the Old Town Parker District. And in particular, Parker Station is the host site for some of the high profiled events such as the Smokin Brew BBQ event (Well over 10,000 people attend each year), Halloween on Mainstreet and the Parker CarFest. Please note below several of the events and sponsor information that make the Old Town Parker District special in the greater Parker community. Mayor's Holiday Lighting: Come and Celebrate the Season! Enjoy another Holiday Tradition in downtown Parker. Bundle up and bring your family and friends at the annual kick-off to the season at the Mayor's Holiday Lighting Hosted by the Town. from Thanksgiving through Christmas night. The annual Carriage Ride Event is brought to the Old Town Parker district by the Parker Chamber of Commerce, Town of Parker and the local property/retail business owners. 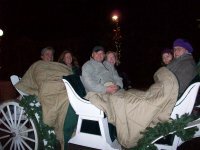 Start a new holiday tradition in your family this year and come to Old Town Parker for the Holiday Carriage Rides. Free Holiday Carriage Rides complete with entertainment, light displays, decorations, treats and beverages, Christmas storytelling, crafts for the kids, and of course, the chance to visit with Santa Clause and tell him your secret wishes for Christmas! One ofthe many Annual Holiday events in downtown Parker, the Parker Christmas Carriage Parade, is a valued tradition held in Old Town Parker. The Town of Parker and the Colorado Driving Society present the Christmas Carriage Parade the second Saturday of December each year. The Parker Carriage Parade is the largest horse drawn carriage parade in the State of Colorado and has enjoyed over two decades of parade entertainment for the community. The event features live ice sculpture carving, a holiday farmer�s market, a petting zoo, pony rides and pictures with Santa! This spectacular, all-equestrian, holiday parade begins in downtown Parker on Mainstreet. Come and see the ice sculpture, and enjoy the many other events, while you await this special parade of decorated horse-drawn carriages, wagons, riding groups, minis and marching bands from across Colorado. Join the fun on this magical afternoon when the streets are lined with families and eager children hoping to catch a glimpse of Santa! Parker Station Professional Office Building provides the largest location for Holiday Decorations and event staging of any location in the Old Town Parker District. Whether it be Holiday Lights, Xmas trees in every retail tenant's "window", colorfully decorated bronze horse sculptures, or big "blow ups" of Santa and his friends, Parker Station represents the best of Parker during the Holiday Season. Parker Station is the location for the entertainment "staging" for the Carriage Rides and the best public viewing site for the Carriage Parade too....we encourage all to come and join us and have fun during the Holiday Season. Farm Fresh Vegetables, Home Made Foods, Artisans, Health and Beauty, Baked Goods at Parker Road and Mainstreet Sundays from 8-2 in front of Parker Station Professional Office Building each Sunday from Mother's Day through October of each year. Parker Station Professional Office Building is a Cornerstone Member of the Parker Chamber of Commerce as well as a Sponsor of theParker Country Festival is the largest event, well over 100,000 people attend every year for this three (3) day event, in the greater Parker community. You�ll travel around downtown Parker visiting the various participating businesses where they�ll be serving a red and a white wine and sometimes some finger food. Come to the tent that is located just West of the Parker Station building on Mainstreet. Have your ID and $15 ready. You�ll receive a nice wine tasting glass, 10 coupons for wine samples and a goodie bag filled with offers from the local town merchants. The Mainstreet Center is the Cultural and Recreational Hub in Parker and is located in the heart of downtown Parker. The Mainstreet Center serves as an important cultural and recreational hub for the Town and is located at 19650 E. Mainstreet. The Mainstreet Center Auditorium seats 200 and hosts cultural events including plays, concerts, children�s performances, recitals and large classes. The gymnasium is home to numerous youth sports and Parker Recreation activities. The Mainstreet Center is also the site for year-round events including tot classes, music, theater, languages and art. Parker Station Professional Office Building is a Corporate Sponsor of the Parker Artist Guild and supports the guild’s mission of advancing the development of fine arts in Parker. The Parker Artists Guild holds several exhibits throughout the year as well as instructional demonstrations and workshops. One of the many highlights of The Parker Arts Guild is the Art In The Park event each August in Downtown Parker. The Parker Arts Council provides opportunities for cultural enrichment through participation, education and outreach to the local community and is dedicated to supporting community events and activities and focuses on the enhancement and growth of the "Arts" works with many local and state agencies and is supported by many businesses within community. The Parker Arts Council brings us PARKER OKTOBERFEST each year in O'Brien Park Parking Lot - Corner of Parker Road and Mainstreet in Historical Downtown Parker. The festival will honor German heritage and traditions by presenting live authentic German music, Bavarian dancers, a biergarten, food, vendors, and children's activities. There will be plenty of fun and activities that the whole family will enjoy. Come join us in celebrating German tradition and add a little umpah pah to your day. Where in the world can you do so much in one day as in Old Town Parker on the Carriage Parade Day! In O' Brien Park.... just wonderful fun to see the families enjoy the actual "art" of the process of carving blocks of ice into a wonderful reindeer pulled sled...that is our Parker community... all about families and making something happen! AND... there are many more other events that occur in the Old Town Parker District that are too numerous to list here. For more information on these varied events, please visitthe event web site for on going monthly information. It is important to note that all the above events and community activities take place throughout the year and within only two "blocks" of our Parker Station Professional Office Building. Parker Station Professional Office Building is a Corporate Sponsor of the Parker Car Fest and is the "host site" for the entire event.